Optimum Ceramic Resonator Selection of ZTB456/500/503/912F Oscillation. 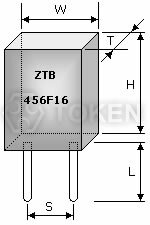 Optimum Resonator selection of Token ZTB456/500/503/912F oscillation parameters make possible according to applications. 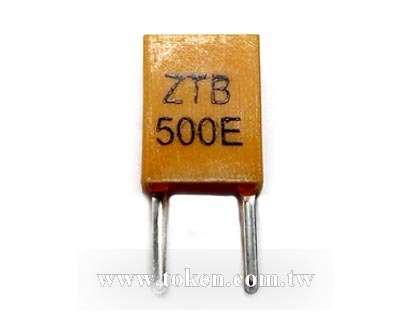 The ZTB456/500/503/912F series provide reliable start up and stable oscillation in microprocessor circuits across a wide variety of applications. The ZTB 456F multiplexers series is designed to provide frequency modulation for HI-FI stereo application. These resonators are offered in the frequency accuracy 19kHz ± 38Hz and 456kHz ± 2kHz with various applicable IC. The ZTB912F Multiplexers Series is specially designed to provide frequency modulation for HI-FI automobile stereo application. 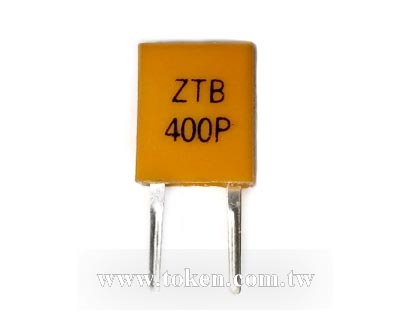 The ZTB 500/503F Series is designed for TV horizontal synthesizer circuits. These resonators are offered in the following frequency accuracy with applicable IC. 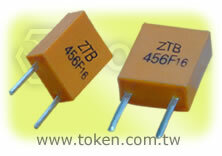 All ZTB456/500/503/912F are Murata Compatible CSB456/503/912F. Application of ceramic resonators specific designs also available including tighter tolerance specifications adjusted to frequency requirements. Products conform to the RoHS directive. Token will also produce devices outside these specifications to meet customer requirements, with comprehensive application engineering and design support available for customers worldwide. Download complete datasheet KHz Ceramic Resonators (ZTB456/500/503/912F) PDF. Highly reliable design with excellent environmental resistance. Standardized for use in low profile devices.